Trusted Clean's Optimal Wet Look Floor Finish is the best of all our floor finish waxes for 'optimal' gloss in heavy traffic settings. A beautiful wet-look gloss can be maintained using traditional spray buffing or with repeated high speed burnishing programs. Easy to apply, superb leveling and fast dry times allow for rapid recoats. Optimal is an excellent choice for use in schools, super markets, health care facilities, hospitals, office buildings and any industrial setting due to its superior Resistance to marking and soil discoloration. We offer complete instructions on how to properly apply floor finish and proper burnishing procedures for those who are new to high shine floor finish care. Customers who were interested in the Trusted Clean 'Optimal' Wet Look Floor Finish - 2 Gallons were also interested in the following items. I have been using this product for years on stone and slate floors in my cabin. Mop the floors then apply product with a mop for an amazing finish. 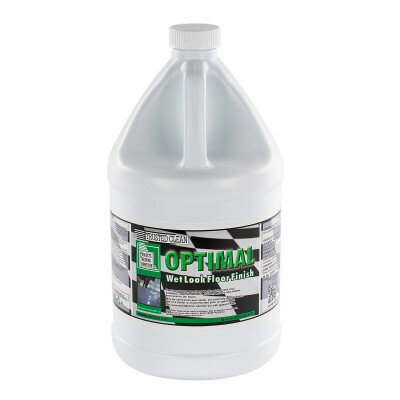 This is a review for the Trusted Clean 'Optimal' Wet Look Floor Finish - 2 Gallons.